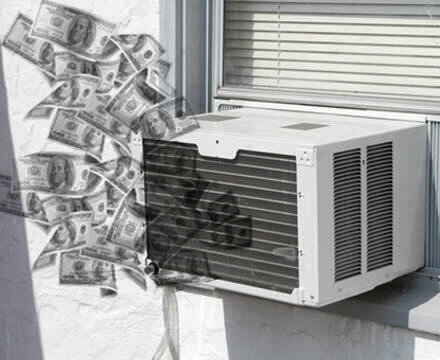 Running a big, energy hungry central air conditioning system can be expensive if you don't know how it can cost you less when you know a few tricks you can learn here. With the right knowledge and common sense, you can substantially cut the cost of your domestic or commercial cooling needs in summer. The things you need to know are actually mostly very obvious and surprisingly simple to put into practice, once you know what they are. In fact, there are just three main approaches you need to take in order to make a huge difference to what your AC is costing you. Let's start by looking at the main reasons that AC costs so much in energy consumption which translates to a heavy burden of dollars flying out of your pocket each day to the local utility company. Each one of these main points can fairly easily be addressed, with the last one being the easiest of all! Let's look at them in more detail. A big and very unnecessary drain on the country's electricity supply comes during summer when a large number of households and businesses fire up their aging or badly maintained AC equipment that does not work as efficiently as it could. Lack of regular servicing, cleaning and maintenance can reduce equipment efficiency by a large percentage, often reducing its output by up to 50% or more. That means for a given level of energy consumption, the equipment is putting out, for example 50% less cooling capacity than it could do when in peak condition. To compensate for lower output, the equipment just works a lot harder to maintain a comfortable level of coolness in the building, using as much as twice the amount of energy to produce the same level of cooling. If the equipment is very old, the best course of action would be to replace it with a modern system. The cost of replacement would soon be met by far lower energy bills annually. If the equipment is running poorly due to lack of proper maintenance, this is easily remedied by calling a local AC engineer who can in most cases rejuvenate a badly performing system and gets it running much more efficiently, using less energy and recouping the cost of the maintenance contract with lower energy bills. When the user erroneously sets the thermostat much too low and causes the AC to overwork to maintain a foolishly low indoor temperature, the simplest cure for the problem of high electricity bills is to relax on the coldness and set the thermostat to a comfortable (as opposed top freezing cold) level. For most people, that comfort zone is around 70-75 degrees. When correctly set in this range, any kind of domestic cooling system, such as a central system, a ductless mini split air conditioner, window AC or even vented or unvented portable air conditioning units will use a lot less energy to maintain this more sensible temperature than it would for a really cold one. Setting the system to make the climate inside the house to feel more like the ice fields of Greenland than a place you can comfortably relax to watch TV or read a book (or do some work) simply wastes energy. It often means the occupants have to sit around in thick sweaters and rub their hands together often like it's mid winter! After reading that short, but informative argument for better air conditioning usage above, it is my guess you will be fired up to tackle your own particular cooling problem by taking this particular bull by the horns and making one or more of these surprisingly simple changes. These are changes that can have such a devastating effect on lowering how much you are spending to keep cool in summer!